Say you want to apply for a loan to pay for an apartment. The loan is going to come from a bank and that bank wants to get to know you before it lends you a heap of money. So the bank is going to review pages and pages of you: your credit history, work history, your income, your bill payments, and much more. 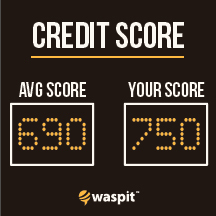 Finally, your data is analyzed by a credit analysis agency and you are given a three digit score ranging from 350 to 800. The higher the score, the better shape you’re in and the more likely you are to get awesome rates on that apartment loan. When applying for a credit score, you want to voice your “economic confidence.” This basically gives the bank assurance that, since you pay bills on time and you’re not in debt, you’re going to handle this loan really well and pay it back on time. To earn a high score, clear up any doubtful signs like pending credit card applications and outstanding debts. You can start building credit or improve a score by making credit card payments on time and consistently but be wary — credit cards will make heavy impacts on your score depending on how you treat them. Banks look at the number of credit cards a loan applicant has. One is fine so long as it’s paid off consistently. However, some part of the population has grown to know credit as a means of disposable income rather than a high interest loan. This presents a problem for banks and splits a great divide between responsible card holders and irresponsible card holders. Having too many credit cards make banks question if you’re able to make all of the respective payments and puts you in danger of debt and staying out of debt is paramount in keeping your score high. Maintaining good credit is literally the same as managing frequent loans. To be clear, credit scores don’t revolve around credit cards. In fact, credit cards are not your only trick in the card game. Prepaid cards are not credit cards but they do help you pay the bills! Actually, paying the bills with prepaid cards can be a tremendously helpful method in boosting credit scores and here’s why: your prepaid card acts in two major ways: actively and passively. On the passive side, behind the scenes, your prepaid card will NEVER allow you to spend any more money than you have — which helps you stay in control. Racking up debt is a sure-fire way of hurting your credit score and while simply owning a prepaid card doesn’t actually help your score it will definitely not hurt it. A prepaid card can also actively affect your credit score when you use it to pay bills. In this case, it acts as a credit card because these bill payments are recorded and sent to major credit bureaus, which handle your credit score. If you continually pay your bills late, your credit score will most likely suffer. If you’re wondering about exactly how your score is made, check out Life Hacker’sbreakdown of the credit score grading system. If you’re thinking about applying soon, this is a great place to start your pre-application checklist. So what’s next? Comment down below and let the planning start here! What’s going to be your first or your next step towards building solid credit? Here’s to all the future applicants, and as always, thanks for reading!